In today’s cyber-driven universe, technology wunderkinds don’t normally go from $50 million buyouts by Google back to the farm. But that’s exactly what Rob Spiro, co-founder of the farm-to-fridge grocery delivery start-up in San Francisco, Good Eggs, did. Spiro and his colleagues from Silicon Valley founded the company a mere 18 months ago, with the idea that their experience in the tech world could be put to good use in furthering the ideals of a sustainable food movement. After selling their social search service, Aardvark, to Google in 2010, Spiro, et al thought to lasso the burgeoning grassroots drive for local, organic food direct-to-consumer in the Bay Area. Spiro had watched a friend who had inherited a family farm struggle with distribution of his harvest through normal channels. When the friend diversified his crops and started selling direct-to-consumer through Farmers Markets, his business was revived. The model seemed promising. Accordingly, Good Eggs has a comprehensive website that allows shoppers to browse local providers – produce, fish, meat, baked goods, artisanal products and, of course, eggs – from the leisure of their homes. A few clicks later, the order is sent to Good Eggs, who contact their suppliers. A package is assembled in their Mission District warehouse and, within 24 hours, your order of the freshest local food possible is available for delivery to your home (for $3.99) or to pick up from the back of Good Eggs delivery trucks at a number of drop spots around the city. The delivery service model serves ‘food deserts’ around the city, where access to local and organic products might not be as accessible. And prices are surprisingly affordable – local strawberries for $2.50 a basket, an organic salad vegetable trio that at $6 (and harvested within 24 hours of order) costs less than such an assembly from a local grocery chain store. Meats and seafood come from sustainable farms and as many organic farmers as possible are tapped, though Spiro acknowledged that some of the smaller farms cannot carry the financial outlay required for “certified organic” status, despite their sustainable practices. Good Eggs has a number of professional advisors on board to lend them further cred. Famed farm-to-table advocate and chef Alice Waters is a part of the team, along with business gurus like Sam Mogannam, founder of San Francisco’s Bi-Rite family of businesses. Spiro said that quality control has presented no problems so far, though occasional hiccups occur, like a delivery truck breaking down or a batch of bread burning. In a grassroots food movement, innovation attracts attention, so Good Eggs has found it needs no advertising beyond word of mouth. Suppliers benefit by telling their own customers of the service and enterprising foodies know where to find service to support their whole foods habit, thanks to internet technology. A perfect circle, in Spiro’s experience. Sadie Scheffer is the founder/chef for Bread SRSLY, an organic, gluten-free bakery that launched almost two years ago, with Scheffer herself making deliveries from her bike. She says that when she joined up with Good Eggs, her business took off. State and local government regulations regarding food safety are always a hurdle for any business involved with food products, but Spiro says that Good Eggs is fully compliant and that local municipalities are welcoming. 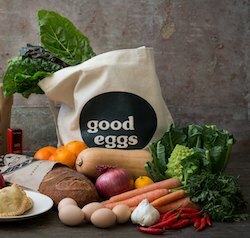 While Good Eggs has not yet achieved profitability status, they are moving forward with plans to expand. They currently operate delivery services throughout the Bay Area, with operations in Brooklyn, Los Angeles and New Orleans set to open within a couple of months. Teams are on the ground in those areas now, setting up contracts with local suppliers. Interested individuals only need click on the local Good Eggs site to set up a delivery stop in their neighborhood.